Jerome Hines Interview with Bruce Duffie . . . . . . When you look at the entry for Jerome Hines in the New Grove Dictionary of Opera, it states he is not only a bass, but also a composer! Besides singing a huge range of standard and lesser-known operas, he wrote his own work on the life of Christ called I am the Way, which has been given in several cities. Toward the end of the article, one also finds he has published not only an autobiography, but also a book of interviews with other singers about their art. Rather versatile for a man still going strong in his 70s. When we met in a mutual friend’s apartment in New York City in December of 1991, I could actually observe Hines in triplicate, for on a table was a double-bust of Hines – one side as Boris Godunov, the other as the man himself dressed for a concert. The living version was tall and imposing yet warm and generous. Very much enjoying his life’s accomplishments, he exuded charm and wisdom with every word. What follows is much of our discussion. It should be noted that besides all the diversity mentioned in Grove, Hines is also a practicing scientist, and that’s where we began. Bruce Duffie: Are you ever sorry you didn’t stick with chemistry? Jerome Hines: I love science and math, and still keep up with my own research and give seminars. This morning I was at the Science High School in Newark. There were about 100 young black children there and we presented them with a show. I started out by saying, “I’m a chemist gone wrong.” It was a very pleasant morning. BD: Does your knowledge and experience in the scientific field help you relate the artistic side to people who are only scientists and researchers? JH: I find that people in the physical sciences seem to have a greater love for classical music than almost any other human endeavor. When I was a student at UCLA, the concerts were highly attended by students of physical science and mathematics – more than by those in life sciences and even music! I don’t know what that peculiar kinship is between the physical sciences and math and the music. BD: Is it, perhaps, a counter-balance in their lives? JH: There is a certain mathematical precision in great music which lies there unnoticed. You’re not aware of it, but it is there. It’s like when you hear a great singer, you’re not aware of their technique, but boy, it’s there. It would take the same kind of mind to compose a great symphony or opera as it would to come up with a great scientific theory. There’s a great deal of logic involved, as well as discipline. I’m not sure a great performing artist would necessarily have a great scientific mind, though someone who can achieve well in one field possibly can achieve well in any field they were interested in. BD: Then this is a question I usually ask composers, but it relates to performers, also. Where is the balance between the inspiration and the pure technique of singing? JH: The technique should be so well-ingrained and so secure that you do not have to be aware of it yourself in extraordinary moments. Franco Corelli made this analogy: “When you walk, you don’t think about walking. Even when you run, you don’t think about running. But when you run down stairs, you’d better think a little bit. When I’m singing in the normal range of the voice, I’m not thinking technique at all. But when the high C is coming, I brace myself and think about giving you the most beautiful high C you ever heard in your life.” It’s just those crucial moments. BD: Do you, as a bass, do the same for a low C? JH: Most singers are not required to have a great low voice. We poor basses are being pulled in both directions. If a bass doesn’t have a good high voice, he’s not going to make it. But a bass should also have a good low voice. So we’re constantly pulling the voice apart, almost like being drawn and quartered in order to accommodate both ends of the scale. It’s quite a struggle. BD: Is this what differentiates between a basso cantante and a lyric basso? JH: It’s funny how people regard this field of basses. For example, a great, great singer today is Samuel Ramey. You can’t fault the guy. He’s a beautiful singer and I admire him enormously, but he is not a basso cantante as I understand the term. If I do “Old Man River,” I do it in the key of C, a baritone does it in E-flat, and Ramey does it in the key of D, which is closer to baritone than it is to bass. Having a lighter voice, it makes him ideal for bel canto and the florid things that he does. For the strictly Verdi-type of roles, as in La Forza del Destino and Nabucco that require a real basso cantante, the lighter voice isn’t really adapted to it. George London was that way – almost a baritone, but not quite – but he wasn’t a real basso cantante either. I know that the basses of the higher tessitura tend to call us basso profundo. We are not. A basso profundo can barely get above a middle C. The profundo can go from the low C to the middle C, the cantante from about an F to an F or maybe an F-sharp, and those with a little higher voice can go to a high G which we don’t have. They’re not really a Verdi baritone nor a Verdi bass. BD: What happens to a bass who has the low C and a high G? JH: How many have you ever encountered? [Laughter all around] I understand there was one in the Soviet Union a couple generations back! I remember when I was doing the recording of La Favorita by Donizetti, the conductor was hoping I could do a low C. Well, we went through lots of convulsions. I got up one morning and before even vocalizing, I ran right to the studio to sing the low C. It still didn’t work. I’m a cantante and can sing a good low E, but not a low C. If you find someone with a good low C for “Asleep in the Deep,” when he gets to a D he’s turning red in the face and strangling on an E and doesn’t belong there. BD: This range that you have, does it determine which roles you will sing and which you won’t sing? JH: Yes. Sometimes we make mistakes. I think that during a career, every singer keeps trying things that are more arduous and more audacious until they bump their nose. I bumped mine back in the ‘60s by daring to go out and do Wotan. The average length of a singing role for bass is about 35 minutes. Mephistopheles in Faust in onstage all the time, but sings about 35 minutes. Wotan sings for 80 minutes! The tessitura is high. I can sing it because nothing goes above my range, but it sits up there in the passaggio all the time. So to sustain that for an hour and twenty minutes is just devastating to the bass voice. I met a famous German bass at Bayreuth and told him he was smart not to try the Wotan. He said, “I tried it wahnz. It didn’t vork!” I tried it for five years and really brutalized my voice doing it. In baritone-izing my voice to lighten it, I thought I might even try Scarpia. I had a contract to sing it and was studying it with Lawrence Tibbett, but when the company folded and the opportunity disappeared, I breathed a sigh of relief and decided not to try it again! Not long after that I began to back down on the Wotans. So when you do bump your nose, if you have any brains you back off. Others keep doing it until they batter themselves out of the business. BD: You also did Gurnemanz in Parsifal, but that is written lower. JH: Gurnemanz also takes an hour and twenty minutes of singing, but it’s really written by Wagner for basso cantante. Not all of his bass roles were. 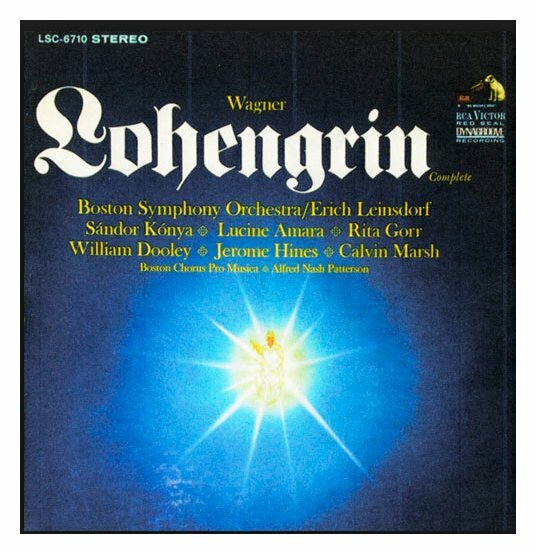 King Henry in Lohengrin is like a short Wotan. It’s very high and punchy, but it’s short enough that you can get away with it. But Gurnemanz is perfect tessitura and so is King Marke in Tristan und Isolde, and Fasolt in Das Rheingold. One of the most impossible roles, and I discussed it with Cesare Siepi once, is Zaccaria in Verdi’s Nabucco. It’s one of those roles which is very extreme in range both top and bottom. BD: So why did Verdi write it so extreme? JH: He was young. [Laughter all around] Wasn’t it his first opera? BD: It was his third opera, but his first big success, and the soprano role of Abagaile also has an extremely wide range. JH: I’ve done Zaccaria, and always sweated blood when I did it because it’s a toughy. There’s the opening scene, the aria in the middle and finally the scene at the end with the low F and the high F-sharps. There is time in between, but of all the Italian literature, I think that’s the toughest. But for a bass, it’s more manageable than Wotan. The trouble is that when a real baritone sings Wotan, he sounds light. You want the color and weight of the basso cantante, but he can’t sustain it. BD: When Verdi wrote Ernani and Don Carlo, did he know how to treat the voice better? JH: I certainly think so. His earlier works are much more difficult to sing. I’ve been taken by the influence of Rossini on Verdi. Nabucco is obviously patterned after Rossini’s Moses. Each one has a beautiful quintet. Moses has a central patriarchal figure. There is no such character in the story of Nebudcanezzar, so Verdi invents a phony one called Zaccaria – who never existed in the scriptures at all – to stand up against the title character. Recently, for the first time in my life, I did Rossini’s Stabat Mater, and I was amazed at how much of it had crept into the Verdi Requiem. We tend to think only of The Barber of Seville and other frivolous things, but Rossini wrote some glorious music, some powerful compositions. BD: Being a bass, you’re always fathers, kings and devils. BD: Did you ever regret not getting the girl? JH: Even Don Giovanni never gets the girl! How ironic! It’s a story of complete frustration. I can’t think of an opera where the bass gets the girl – maybe Eugene Onegin, but Gremin is only onstage five minutes; it’s a wonderful aria, though. But it’s true, we never got the girl, so my love life had to be offstage. I married a beautiful soprano, so there were no problems. BD: When you walk out onstage in costume and makeup ready to sing, are you portraying a character, or do you become that character? JH: I’ll tell you how to do it. I have a mania for doing my own makeup. In some places that will get you into trouble. Russia, for example, was rigidly organized and artists were not allowed to do their makeup. The makeup people had to do it. As a guest, I bullied my way through, and they let me get away with it since it was my practice, but I was the exception. My dad was in the movie business, and one of my first lessons was from Westmore, a famous name in Hollywood makeup. For my first Mefisto, one of the Westmore brothers taught me how to do it. No matter what is painted on my face, I must portray what I believe in of the role, and what goes on my face must be parallel to what I’m doing on the stage. So I have to do it myself. Anyway, if someone else makes me up, I tend to fall asleep in the chair, and that’s no way to start a performance. I don’t mind fake noses or chins, but not the pre-formed ones. I like to create it myself for how I feel that night. I make the nose and cheeks and the chin, and so forth. So, in that two hours before the show, I slowly become the character by sculpting that character in my face. Perhaps there is a predominant mood. For example, Marguerite complains to Faust about his companion’s sneer, so I create the sneer by crinkling the nose up a little bit and painting the basic sardonic mood. I can vary the expressions, but there is that basic something. One time it got me in trouble. I was doing Sarastro in The Magic Flute on the Met tour in Boston [shown in photo at left]. I thought to myself that this is man who is supposed to be gentle and smiling, so I painted a smile. Mr. Bing, the General Manager of the Met, came back after the first act in a fury. He snapped, “What happened?” I asked him what he meant, and he said, “Who’s telling jokes up there? You looked like you were cracking up every moment. What was so funny?” So I told him it must be my make up, and went and changed it. BD: So no matter what it looks like, you have to make sure it causes the correct effect. JH: And that only comes from actual experience. You don’t know until you do it. That time, it backfired. Occasionally, you have the opportunity to change the makeup slightly. 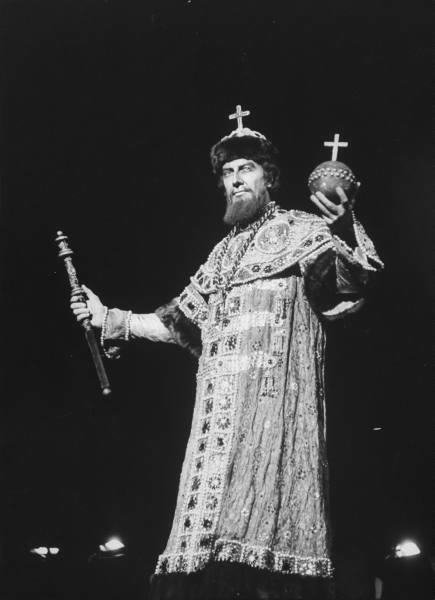 In Boris Godunov of Mussorgsky, between the opening and the final scene, you want him to age. His hair gets grayer, he gets more sallow and sicker, so usually that transformation comes about after the mad scene and before the death scene, though it might be better between the coronation and the mad scene because more time elapses. BD: You are a deeply religious man. Tell me about playing the Devil. JH: Mephistopheles in Faust is the second most important part in my life, and the first important one I ever did. When I first began doing the role, women used to come backstage and tell me, “If that’s what the Devil’s like, I want to go to Hell.” In those days I was very flattered. BD: You made him very appealing. JH: Yes. Then, as I grew up a bit, I thought I’d better wait because we’re only seeing one side of him. People use the phrase “ugly as sin,” and I say, “Sin isn’t ugly. If it was, nobody would want it.” The ugliness comes as the consequence of sin. So I got to thinking how, in the opera, he starts out in a very charming and intellectual way. Then he’s the good sport and it’s all seduction. You start getting into the ugliness when Marguerite murders the child, and as the opera progresses you see that the servant – which is the Devil – becomes the master. I realized then that in every scene the Devil challenges Faust and Faust slaps him back; but little by little, the Devil’s challenges get stronger and by the scene when Valentin gets killed, the Devil is ordering Faust around. But when Faust says, “Shut up you fiend!” the Devil has to back down and people often misunderstood this whole switch because in the final scene, the Devil is trying to get Faust to get Marguerite out of the prison quickly, and Faust tells him to get out. Mefisto’s reply was changed to, “I obey.” Originally it was, “Hurry up!” He was the master and didn’t have to obey any more, but they changed it to soften the opera’s ending. Anyway, I was at the most fundamental place of Christianity – Bob Jones University, where they do both Shakespeare and opera on a big scale. I was doing Boito’s Mefistofele down there when Bob Jones II came into my dressing room at the dress rehearsal. He was a fine actor himself, and he looked at me and quoted, “And Lucifer was the most beautiful of all the angels.” There was nothing beautiful on my face at all, and I said he was right. So in the opening performance I did a very classical, handsome face, but played it cold as ice. Afterwards, I thought there was still something incomplete about it. It happens in the opera, so I made it happen on the face, and from that time on, I start with the cold classic beauty and every scene I change the makeup a little bit more toward the fiend, so by the end, he’s a monster. Now when the reviews say, “Mr. Hines’ portrayal of the fiend…,” I’ve succeeded. BD: But in the end, he is not defeated, is he? JH: In the Gounod version, he loses Marguerite but not Faust. In the Boito setting, he loses the whole ball of wax. BD: Is it more satisfying to portray a Devil who loses everything? JH: I have divided feelings about these two operas. Gounod’s Faust is one of the most perfect things ever composed. The drama is beautiful and it moves. 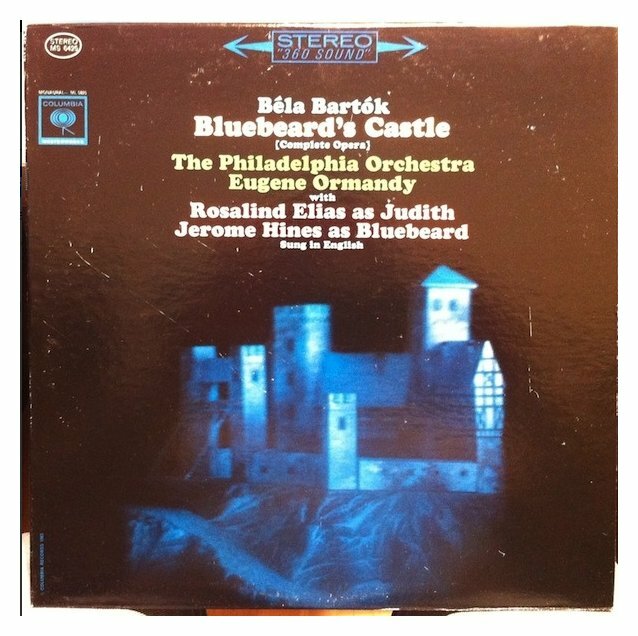 I compare it to The Barber of Seville in this respect – here are two operas that never let me down. There’s always something wonderful happening; the drama is always going and the music fits it to perfection. They are masterpieces both musically and dramatically. The Gounod is very professionally done, while the Boito has many spots that are not amateurish, but there are glitches. People say you need a fine conductor for the Boito, and maybe it’s because there are times when you feel it in two, but the words go into a three-rhythm and the score says colla voce – meaning “with the voice.” So you follow the voice or it doesn’t fit rhythmically. On the other hand, where do you find such a wonderfully glorious scene as the Prologue (and Epilogue) of the Boito, except maybe the coronation of Boris, written by another amateur! Mefistofele has divine stuff in it, but as a structure, it stops and goes once in awhile a while. BD: But you have to make it work. JH: That’s right. You have to work to make it work. Faust will drag you along with it, whereas you have to drag Mefistofele along once in a while. BD: So that’s the difference between a good opera and a masterpiece? JH: Yes, but there are masterful moments within Mefistofele. I love to do them both. BD: OK, the “Capriccio” question – in opera, where is the balance between the music and the drama? JH: Unfortunately, you’ll often get one extreme or the other. You’ll get someone who’s a great actor and a very poor technician and a poor singer, or someone who’s a glorious vocalist who hasn’t the slightest concern about acting. I remember during my debut season of 1946 in San Francisco, I was singing Biterolf in Tannhäuser and the stage director was constantly after me to stand this way and do that, and finally Lauritz Melchior walked over to me and said, “You just plant your feet firmly on the floor, face the audience and sing with that beautiful voice. That’s all. Forget all that ‘acting’ stuff.” Well, people with heroic voices can do anything they darn please because they sound so good. BD: Is it better now that we’re in the age of the stage director and more is demanded of the singing-actor? JH: I’ve seen many stage directors, and it’s still a matter of power-politics. I was doing Verdi’s Ernani one time, and at the end I blow the horn and the tenor is supposed to commit suicide. The soprano grabs my knife and is supposed to lunge at me for my hideous crime. Well, this soprano didn’t want to lunge toward me. I tried to insist because of the dramatic integrity, but the stage director backed her because she was a very big name, and this was a very important dramatic moment. That’s an opera that is very vulnerable if it’s not done with good drama. BD: Do you want more dramatic action in each piece? JH: It has to be a perfectly equal balance, and I’ve tried to achieve that during my whole career. Each opera and every character should be researched not by some pattern, but by what is the most important factor involved. For example, I don’t believe in psychoanalyzing Don Giovanni. It’s not written in that vein. When I did my first Boris Godunov, I asked various stage directors about the character and got a huge diversity of opinion. All they had in common was to say he was crazy. Well, I was going on a tour of various universities for about eight weeks before doing the opera at the Met, so I interviewed ten psychologists and psychiatrists. I would read them the basic libretto and ask what was wrong with the man and how he would act. Unfortunately, I got just as much diversity from them as I did from the stage directors! That shattered my faith in the field of psychiatry and psychology. BD: Is it possible that the libretto just leaves too much out, and that a few more lines or another scene or two would have helped? JH: I’m not sure, but I managed to coalesce the whole thing into three basic pictures of what Boris could be like and how he could be played quite differently. I wrote an article called “The Three Faces of Boris,” which was published by Musical America. Everybody said I was too analytic, but I wanted to bring some sense of reality to this character. BD: Do you always choose among those three facets? JH: I settled in on one of the three. The first was that there was nothing wrong with him and he was just a product of this time. They believed in ghosts, so a flicker of light in the corner was a ghost because they believed in those things and they would interpret things that way. That was their way of thinking, nothing crazy at all. The next opinion was that Boris was a real paranoid schizophrenic, but the doctors say that a real schizophrenic cannot transfer love to any object outside of himself. He is in his own glass box, and he would only love his son in as much as the son was an extension of himself and his throne. There could be no real love in a human and emotional sense. So that didn’t seem to jibe with the terribly emotional death scene between Boris and his son. He seems so warm and so real and so concerned for the kid. BD: But that’s in the music and not necessarily in the text. JH: That’s right. But the third point of view is that the man is a manic-depressive, subject to big swings of emotion. Shuisky was the hated father-image without whom he couldn’t survive, so he would scream and threaten him and immediately ask his counsel. Mussorgsky may have been tried for manslaughter early in his life, which may have accounted for his drinking problem to try and drown out the memories. In a program note for the Paris production, the composer says he completely identifies with the character of Boris, a man who had the guilt of having killed someone. Mussorgsky also complained of having a week heart, and said he would die of a heart attack and knew the feeling of suffocation. So he gave all those symptoms to Boris. This is the power of the opera. It is so real because Mussorgsky was living out his own suffering in the role. BD: When you play Boris, is it necessary for you to know that after a very brief reign of the son, it is Shuisky who sits on the throne? BD: Have you been pleased with the recordings you made during your career? JH: Some yes, some no. I think the Brahms Requiem was too high for me. 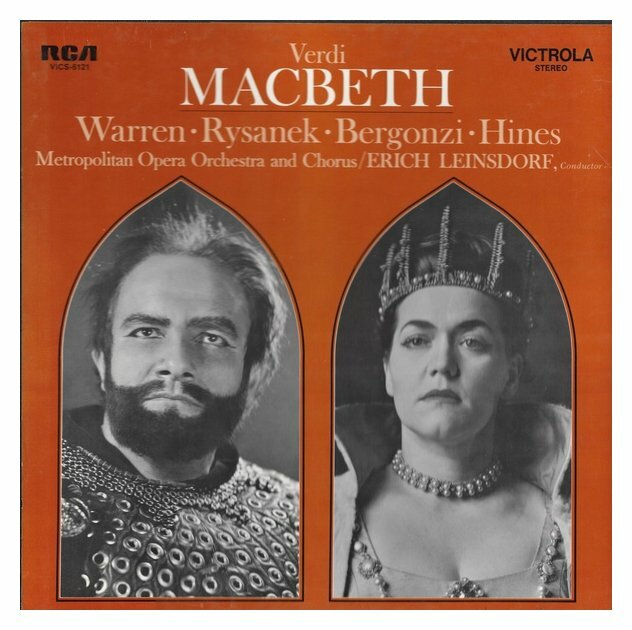 On the other hand, I’m very pleased with the Macbeth recording. The only problem is that the role of Banquo is too short. I get killed off too soon. I usually do the killing, but not there. To read my Interview with Leonie Rysanek, click HERE. To read my Interview with Carlo Bergonzi, click HERE. To read my Interviews with Erich Leinsdorf, click HERE. BD: What advice do you have for young singers coming along today? JH: I’ve got a lot of advice because I’ve been doing a lot of thinking recently. An article appeared in Opera News on Blanche Thebom, and she felt that young singers were being held back and retarded by the system of teaching today. [See my Interview with Blanche Thebom.] Blanche was singing major roles in her late teens. I was 19 when I got my first contract with the San Francisco Opera, and at 20 I had my first concert with the Los Angeles Philharmonic in the Hollywood Bowl. At 21 I was doing Mephistopheles in Faust and everyone was predicting I wouldn’t be singing in five years. I don’t know what I did wrong because I’m still singing! I got my Met contract when I was 24. My wife, Lucia Evangelista did her first Mimì in the big theater in Genoa at 19. When I came up, if you weren’t singing at a major house like La Scala or the Met by the age of 26, people asked what was wrong. Nowadays, kids are 25 or so before they even finish their Master’s degree, and all they’ve been taught have been art songs and Mozart. BD: Is it because of the numerous cases of singers doing big roles at 20 and 21, and by 26 they are burned out? JH: Perhaps, but here’s an example... a big, heavy soprano at 20 goes to a music school and is told she is much too young to be singing Aïda. She’s told she’ll be singing that role when she is 30. NO! That kid should be learning Aïda when she’s 20 – learning it! She shouldn’t perform it very often when she’s 23 or 24 – maybe 3 or 4 times a year! When I was in college, I had a triple major – Chemistry, Physics and Mathematics. I studied singing on the side in my spare time. I would run out to the Oakland Opera Festival, and spend a week doing two performances of Faust, then go back to school again. Six months later I’d do it again in New Orleans, and go back to school. The point is to do these big roles in moderation, but be teething on them. You don’t become a dramatic singer; you are either born one or you’re not one. You don’t learn to be an opera singer by doing art songs; you learn to be an opera singer by learning opera. When I was 16, I took my first lessons. My teacher said he shouldn’t teach me until I was 18 because most boys’ voices don’t develop until they’re 19, and that’s usually a good rule. But I was already six-foot-six and had a bass voice, so when I was finishing my 16th year, he had me learning Basilio in The Barber of Seville. When I was 18 he said I should start learning Faust. He rented a theater for his workshop and I did the second act. The Garden Scene is not the biggest, but it gives you a substantial portion of the role. Then I did a role in Rigoletto and Biterolf in Tannhäuser and Ramfis in Aïda. By the time I was 20, I knew 20 operas. In my first year at the Met, I was covering 14 operas. BD: That’s unheard of today. BD: But you heard it in that voice, and other voices shouldn’t be pushed into that repertoire. JH: Right! You should not take a kid with a natural lyric voice and make him sing dramatic parts. You’ll strip all the gears. BD: So maybe the academicians don’t have the discriminatory facility to know which voices should be pushed and which should not. JH: There you are. I’m not saying those in academia cannot be great teachers; they can be. However, their disadvantage is that they never heard the greatest voices in a studio. They have no conception of what those voices sound like in a room. They hear those voices in a big hall and think they have students that sound the same. 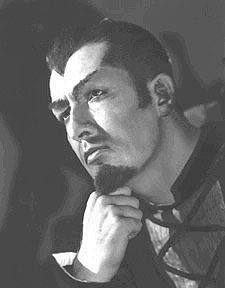 When I first heard Mario Del Monaco in a rehearsal room, it plastered everyone against the wall, yet some teacher will tell me they have a tenor who makes Del Monaco sound puny. Well, maybe that kid should be singing Rossini in a small house, but that teacher will think the sound is heroic. We singers do not adjust our technique to fit the room. We sing the same no matter where we are. So if we’re in a room, we can be rather oppressing with the kind of sound that we make. If someone tells me it’s a small hall and to take it easy, then I won’t be able to sing. We sing the way we sing, and if you change you get off track and you don’t sing well. BD: So there is just one way for you to sing. BD: Is there just one way for everyone to sing? JH: No. Everyone has a slightly different physiology, but it’s not that different. Our muscles are the same. Some are a little stronger or a little weaker, but muscles can be strengthened by exercise. There are conflicting schools of singing, but they’re all viable. When I went to the Met in 1946, they said that two other recent-arrivals wouldn’t be singing in five years because they had a different kind of vocal production. Those two were Richard Tucker and Robert Merrill. Tucker died at 65 and was still singing, and Merrill is still going strong in his mid-70’s. Lauritz Melchoir had a very squeezed production – I thought it was like squeezing toothpaste out of a tube, but it was so gigantic and heroic. Martinelli also had the same kind of production but it was a big sound and I heard him sing Pagliacci at 68 in the Hollywood Bowl. Granted, Nicolai Gedda didn’t sing like Tucker and John Alexander didn’t sing like Del Monaco. All of them had different approaches to singing. There are maybe four different schools of singing, each very different from the others, but they all work. BD: So you need to decide if the youngster is best suited to play vocal basketball or vocal football. JH: That’s a good point. A real muscular guy won’t have the speed and agility, but you try to put all the elements together. When the New York Times did a story on Robert Merrill, Dorothy Kirsten and me for our simultaneous 30th anniversary with the Met, I noted that two of us had the same teacher. That teacher probably increased our longevity, but everybody who studied with him sounded different. That’s unusual because ordinarily a teacher has a pre-conceived sound that he loves. BD: Usually you can tell by hearing the voice who a student has coached with. JH: Right. Some put the sound up in the nose and in the mask; others teach a dark, throaty sound. But, as you say, often you can tell. I brought a tenor to my teacher, and six months later he sounded much better, but it was bright clear sound. Merrill and I have dark, heavy sounds. I wondered how that could happen with our teacher, and he told me that instead of asking for a sound, he asked for the five pure Italian vowels. If the sound that comes out is pure, that is your sound. Everyone has a different shaped face and chest, and all the cavities that resonate are constructed somewhat differently. So if you produce a pure vowel, whatever sound comes out is your unique sound resonating from your unique chambers. Those pure vowels are E, A, AH, OH, OO. I think the other factor that helps longevity is training on fast, coloratura-type scales with all the notes separated by a slight impulse. My teacher called that separation a half–h. That keeps the voice flexible. You can’t make it rigid. Keeping the vowel up and down keeps just one column of sound and one color. He didn’t really know how to teach the high voice, so I had to learn that on my own. Every singer has to be self-taught to a certain extent, too. BD: Without naming any names, are we getting singers today who are on the level of the greats of years past? JH: Every generation does produce a certain number of great voices. We don’t have the concentration of great voices in one place like we used to have. In the old days, the Met – and America in general – represented big money because we had this concert complex of 2000 cities around the country organized for recitals. We opera singers earned about 80% of our income from concerts using the “Met” name. That’s why everyone wanted to sing at the Met. The policy was to have the leading singers stay all season doing lots of roles both in New York and on tour. Now, a great voice will come in, do one production and leave. Part of the collapse of the Met tours was that they didn’t bring the stars any more. We had stellar casts and now they’re very much watered down. Another thing is the money spent these days on productions. The conductor and stage-director are most important and the singer is incidental. I remember buying some very nice prints at the British Museum for $3 each. When we got home, my wife had them framed, and the framing cost $65. At the Met, I see these great productions and not the congregation of talent I used to see. The Met has the great stars, but they wander in and wander out. After all, the singer is the picture and the production should be the frame. I was told by stage hands that the Aïda in the old house needed two truckloads of scenery. In the new house, their Barber of Seville required twenty truckloads. BD: Thank you so very much for spending this time with me. JH: I’ve enjoyed expounding a bit. WNIB, Classical 97 is beginning its 40th year, and Bruce Duffie has been with the station for just about half its life. Next time in these pages, a revealing account of being a “super” and the man who ran the corps at Lyric Opera of Chicago for several years, Kenneth Recu. [See that interview HERE.] Then to start 1995, a 60th birthday conversation with the distinguished stage-director Bodo Igesz. 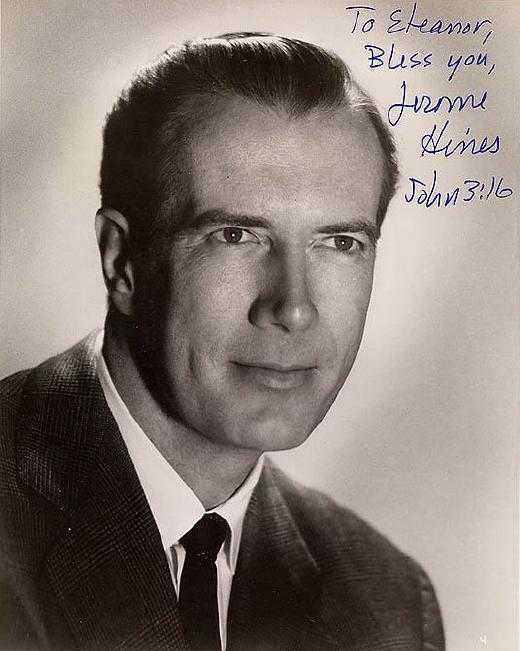 THE AMERICAN bass Jerome Hines, whose career as a singer lasted well over half a century, spent 41 of those years at the Metropolitan Opera, New York. 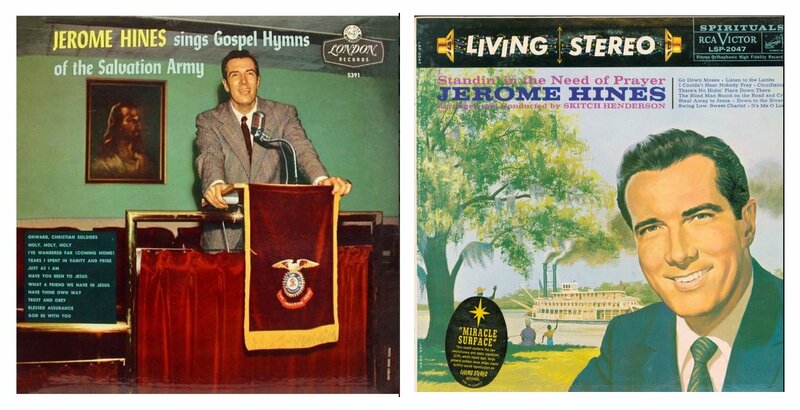 Jerome Albert Link Heinz (Jerome Hines), singer, composer and writer: born Hollywood, California 8 November 1921; married 1952 Lucia Evangelista (died 2000; four sons); died New York 4 February 2003. His enormous repertory, spanning from Handel to Britten and Stravinsky, included Italian, German, Russian and French works. His unusual height, of 6 ft 6 in, and unusual thinness were great assets in the many roles of authority that he sang, but were also put to wonderful use in one of his few comic roles, Don Basilio in Rossini's Il barbiere di Siviglia. 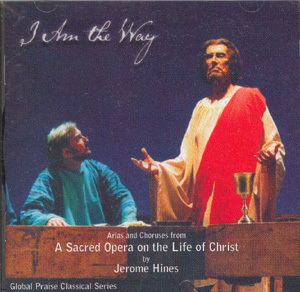 In his mid-thirties Hines became a born-again Christian, and later composed an opera on the life of Christ, I am the Way. 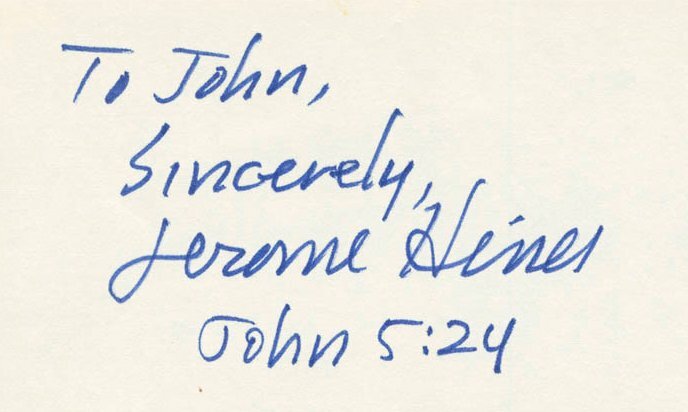 Jerome Heinz (his real name) was born in Hollywood in 1921. He studied chemistry, mathematics and physics at the University of California in Los Angeles, at the same time taking singing lessons with Gennaro Curci. He made his stage début as Bill Bobstay in HMS Pinafore at the LA Civic Light Opera in 1940. The following year he made his operatic début at San Francisco at a popular matinée performance on 19 October 1941 as Monterone in Rigoletto. The title role was sung by the great American baritone Lawrence Tibbett. Heinz also sang two performances of Biterolf in Tannhäuser, whose protagonist was sung by the even more famous Danish tenor, Lauritz Melchior. The publicity generated by this short season brought several offers of work from concert and operatic agencies, so Hines, as he had now become, decided to be a singer, not a chemist. From 1944 to 1946 he sang with the New Orleans Opera, and also appeared in Rio de Janeiro, Buenos Aires and Mexico City. 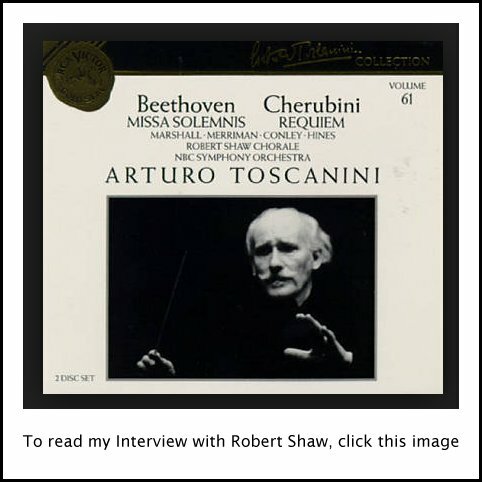 He also sang in concerts conducted by Toscanini and with the maestro recorded the bass solos in Beethoven's Missa solemnis. 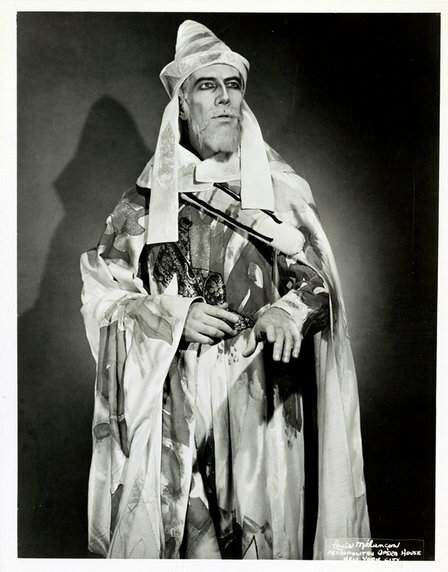 In 1946 he won the Caruso award, and made his Metropolitan début on 21 November as the Officer in Boris Godunov. Graduating shortly to Pimen in the same opera, he finally moved on to Boris, which became his favourite role. During the next four decades Hines sang 45 roles at the Metropolitan alone. These included Sparafucile in Rigoletto, Colline in La bohème, the High Priest Ramfis in Aida – one of his most imposing characterisations – Swallow in Peter Grimes, Banquo in Macbeth, Mephistopheles in Faust, Sarastro in The Magic Flute and two roles in Verdi's Don Carlos, King Philip II and the Grand Inquisitor. These were among his very finest roles. In 1953 Hines came to the Edinburgh Festival to sing Nick Shadow in The Rake's Progress, the British stage premiere of Stravinsky's opera, presented by Glyndebourne. The bass's long thin frame was exactly right for Shadow, while his very large, deep voice and superb diction also suited the music to perfection. The following year Hines sang Mozart's Don Giovanni, a role he also took on at the Met and in Munich. In 1958 he appeared at La Scala, Milan, in the title role of Handel's Hercules, and the same year began a five-year stint at Bayreuth, singing Gurnemanz in Parsifal. Later he sang King Marke in Tristan und Isolde and Wotan in Die Walküre. His Wagner repertory in New York also included Hunding in Die Walküre and Wotan in Das Rheingold. After his visit in 1962 to Moscow, in 1968 Hines published an autobiography, This is My Story, This is My Song. His opera, I Am the Way, was performed in Philadelphia in 1969. 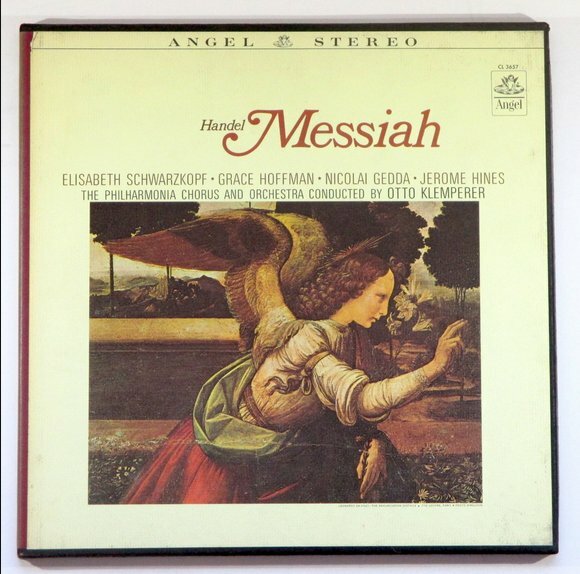 Hines himself sang the protagonist, while his wife, the soprano Lucia Evangelista, sang Mary the Mother. Hines gained a congenial new role at Rome in 1984, when he sang Arkel, the old, blind king in Pelléas et Mélisande. Though he retired from the Metropolitan in 1987, he continued to sing elsewhere in America, and in 1988 at Newark he sang Il Cieco, the blind father of the heroine in Mascagni's Iris. The following year he appeared as Ramfis, a role he had sung well over a hundred times, in New Orleans, 45 years after his début in the city, returning there in 1987, at the age of 76, to sing Sarastro. This interview was recorded in New York City on December 12, 1991. Portions (along with recordings) were broadcast on WNIB in 1994 and 1996. The transcription was made in 1994 and published in The Opera Journal in September of that year. It was slightly re-edited and posted on this website in 2009. More photos and links added in 2015. 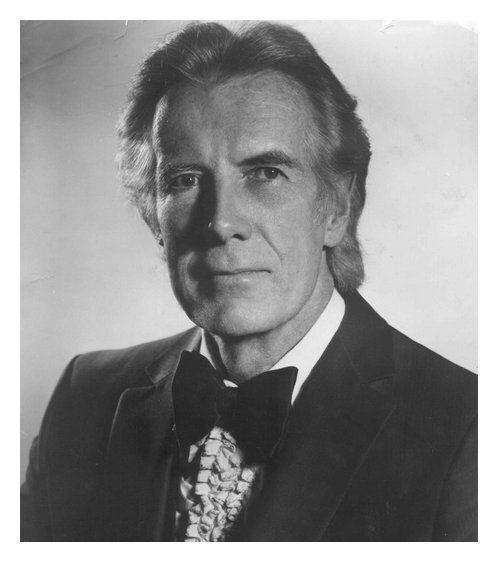 Award-winning broadcaster Bruce Duffie was with WNIB, Classical 97 in Chicago from 1975 until its final moment as a classical station in February of 2001. His interviews have also appeared in various magazines and journals since 1980, and he now continues his broadcast series on WNUR-FM, as well as on Contemporary Classical Internet Radio.